Ianus J. Wolf writes whatever furry fiction happens to come to his mind, which is usually horror, some other form of speculative fiction, or adult fiction. In some cases, adult speculative fiction. His furry credits are limited at this time, but he’s working on changing that as time goes on. Splitting time between his human alter-ego means his writing schedule can get pretty busy. His work can be seen in the adult fiction anthology Will of the Alpha. Currently he is the editor of Trick or Treat and Pulp! anthologies for Rabbit Valley. This is in addition to fleshing out a couple novel ideas when he gets the time. Ianus lives in the DC area with his mate Ashe (also a member of this guild) and their lovable labradusky (half lab, half husky). 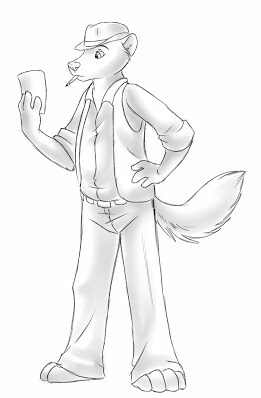 He can be reached at ianusjwolf@gmail.com and for the randomness that occasionally pops into his head and quick updates he does have a Twitter account: @IanusJWolf.